Shirts With Random Triangles: Auburn DB Jonathon Mincy arrested on charges of possession of marijuana. 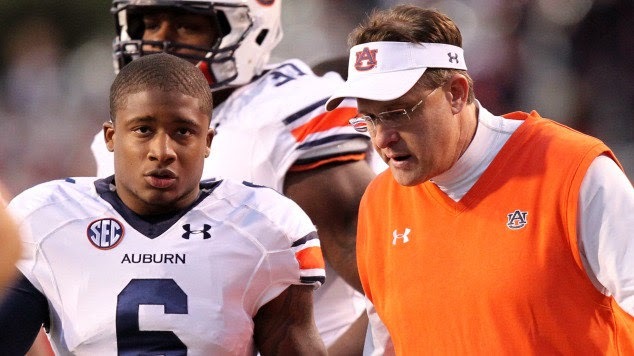 Jonathon Mincy with Auburn head coach Gus Malzahn. Via USA Today. Auburn senior defensive back Jonathon Mincy is facing charges of second degree marijuana possession after being arrested on Friday. According to The Dothan Eagle, Mincy was a passenger in a vehicle that was pulled over for speeding by a Henry County, Al. sheriff's deputy near Abbeville, Al. Henry County Sheriff Maddox gave the details involving Mincy's arrest to The Eagle. Mincy was arrested and released on $3,000.00 bond. Auburn University has yet to release a statement involving the incident. Mincy is a senior DB, and recorded 56 tackles and one interception in 2013.